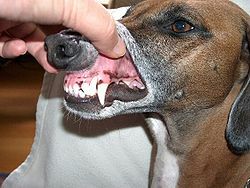 This dug's langer pynted cuspids or "fangs" shaw why thay are pairticularly associatit wi canines. In mammalian oral anatomy, the canine teeth, an aa cried cuspids, dug teeth, fangs, or (in the case o those o the upper jaw) eye teeth, are relatively lang, pyntit teeth. This page wis last eeditit on 1 Dizember 2015, at 00:25.